This year’s conference season started with a 3-day international meeting in the field of agriculture. 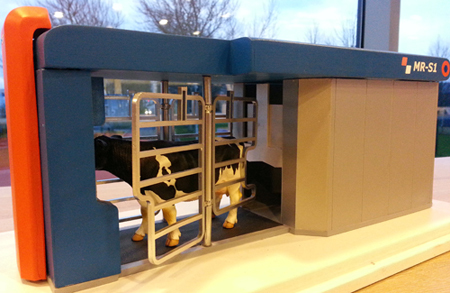 More precisely: on cow health, barn design and the use of robotics at dairy farms. I never thought I would end up knowing so much about cows; their habits, their characters, their needs, their body language and the people around them. You thought dairy farms were run by farmers? Think again… In today’s world, barns are run by cow managers and cow coaches! To check the sound the manure makes when it falls on the floor to make sure the cow is happy (I’m not kidding…), to observe how many times she walks to the feeding area, to check whether she has sufficient space to move comfortably, and to make sure she lies down enough. The more cows lie down, the more milk they produce. What is more, high-production cows need to be lying down a minimum of 14 hours a day. And here I was thinking that they liked standing outside in fields of grass, quietly eating the day away… Apparently, it’s the opposite. The more they rest, the better they feel, and the more milk they give. To the robot, that is. But why would they bother to walk to the robot? Because they are rewarded with concentrated feed when they do. And concentrate to cows is like chocolate to us… so I get them ;-). Once again, this conference showed me that with my job you learn something new every day… which is why I love it so much!